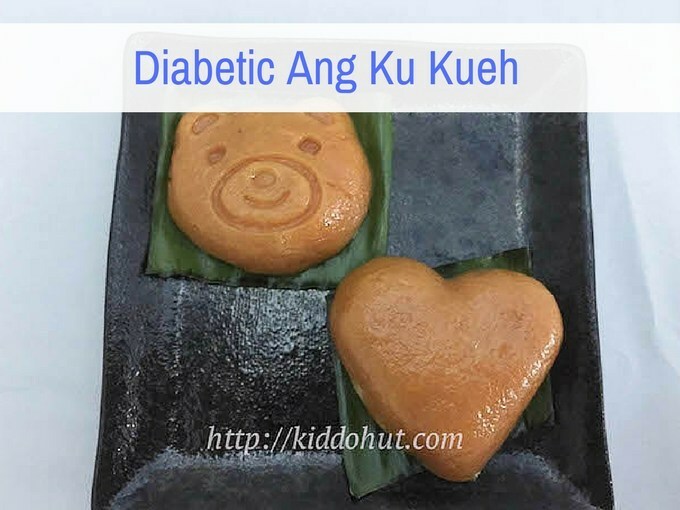 Diabetic Ang Ku Kueh / red tortoise cake 紅龜粿 is a savoury Ang Ku Kueh that is suitable for diabetic’s consumption. Of course, non-diabetic can eat this as well. For people who aren’t familiar with this snack, it is traditionally red in colour, moulded to resemble a tortoise shell and has a sticky chewy texture when eaten. According to the Diabetic Society of Singapore, one out of 9 people aged 18 to 69 has diabetes. That’s about 11.3% of our population or more than 400,000 people. Diabetes if not managed well, can deteriorate steadily to cause devastating complications. Beside eating medication and/or taking injection to control the illness, the type of food consumption is equally important for diabetics. My mum loves kueh but due to diabetes, she has to refrain from eating sweet stuff. So, I decided to make the Ang Ku Kueh that she can eat. In fact, I have made the savoury green bean cake for her previously and posted on Kiddo Hut as well. I made this Ang Ku Kueh using more sweet potato (compared to the glutinous rice flour) partly for myself too. Eating too much glutinous rice flour will make me feel bloated every time. So, I tried not to eat too much of the said flour. Mainly, there are two types of Ang Ku Kueh recipes. 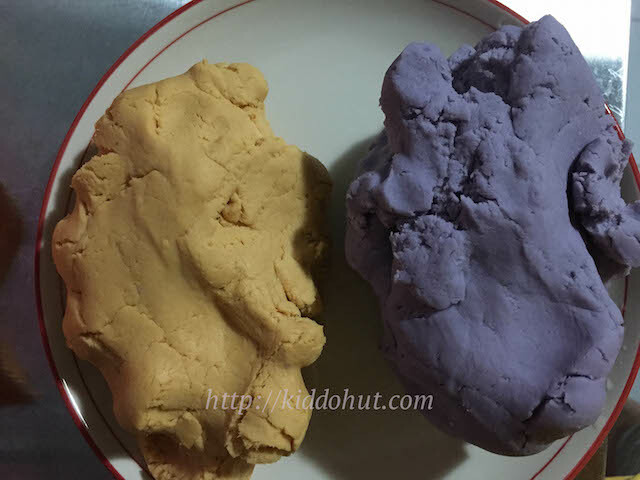 One with sweet potato and glutinous rice flour, and one with just glutinous rice flour. Of course, for some recipes, they added a bit of rice flour. Those that are stall bought usually are made with just glutinous rice flour or a little of sweet potato, otherwise their profit margin would be tremendously squeezed or probably one Ang Ku Kueh would sell more than $2 at least. 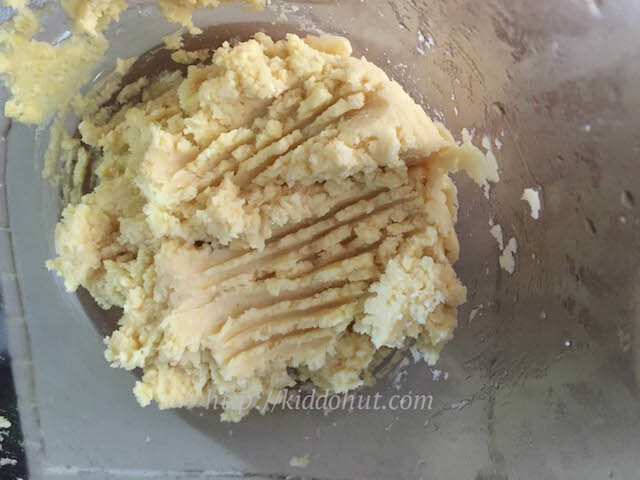 Because of the higher proportion of glutinous rice flour, the kueh usually turns harder if leave at room temperature for too long or left overnight. In my recipe, I used more sweet potato than glutinous rice flour mainly because the earlier is healthier than glutinous rice flour. Why? Sweet potato is high in vitamin B6, rich source of vitamin C and magnesium, contained vitamin D and iron. Their rich orange color indicates that they are high in carotenoids like beta carotene and other carotenoids. And most important, they are naturally sweet-tasting yet their natural sugars are slowly released into the bloodstream. This is especially critical to diabetics. They can consume vegetable and fruits that are naturally sweet but cannot consume food that turns to sugar quickly. And, diabetics need to watch out for their carbohydrate consumption as well, glutinous rice flour is made of glutinous rice which is high in carb. That was my motivation to use more sweet potato than glutinous rice flour. In this way, I do not need to add sugar to make the Ang Ku Kush’s skins. For the fillings, I made it savoury and added Stevia sweetener. I chose Stevia as sweetener and sugar substitute mainly because it is extracted from the leaves of the plant species Stevia rebaudiana. 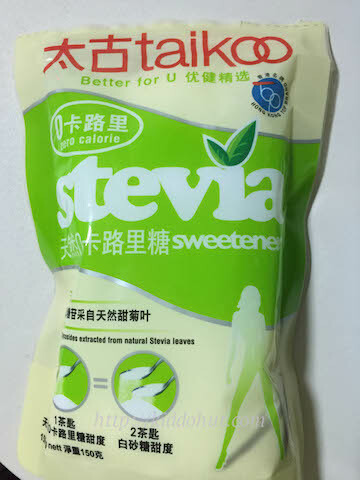 The active components of stevia are heat-stable, pH-stable, not fermentable, have a negligible effect on blood glucose, which makes stevia attractive to people on carbohydrate-controlled diets. I did two batches of skin wraps and tried adding rice flour to one batch, realised the texture was no difference with or without adding the rice flour. 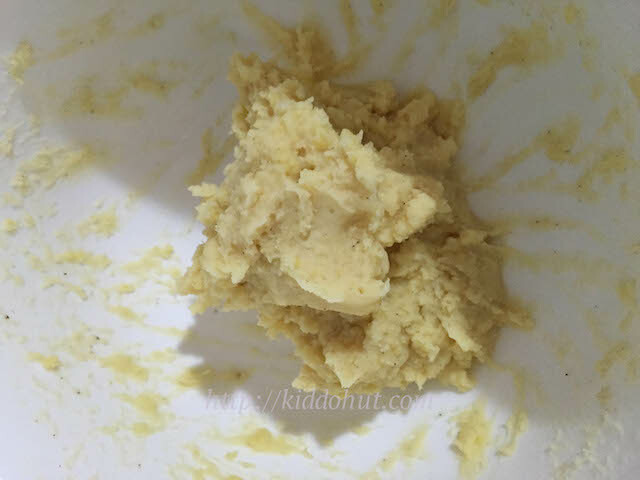 For the fillings, if you wish to cut down stress on making the Ang Ku kueh, you may make the fillings one day before and keep it in the fridge. I didn’t pan fry the fillings (unless your fillings is too wet). I just added the sweetener and salt into the warm mashed beans, and mix well. The heat from the mashed beans melted the sweetener and salt. But, you need to mix it quickly and well. 1. The more sweet potato, the lesser the glutinous rice flour, the more difficult to mould. To “mend” the cracks or lines on the skins during rolling and moulding, put some oil and dust a bit of glutinous rice flour on your hands before rolling the dough into a ball. 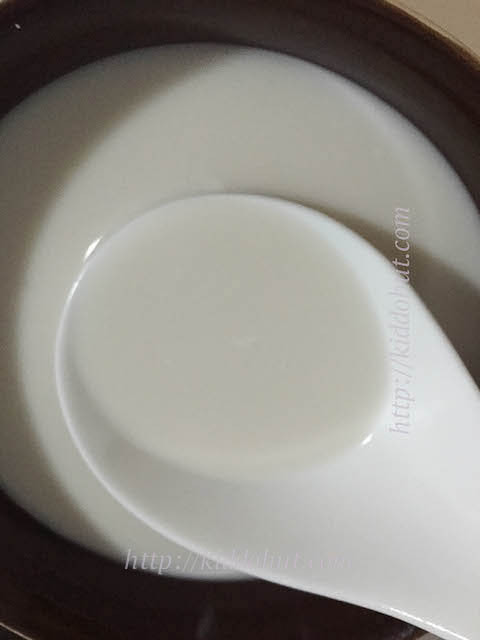 After removal from mould, if there is still cracks or lines, you can use the same method to mend it by rubbing the lines gently with some oil and glutinous rice flour on your hands. 2. The amount of coconut milk / water required depends on the moisture level of the sweet potato. The orange sweet potato is usually more moist than the purple and yellow ones. I used coconut milk in my recipe. Anything with coconut milk is always more fragrant. You can always use lukewarm water instead if you do not have or not wish to use coconut milk. 3. Weigh each dough and fillings. For a 40g capacity mould, I find 23g dough 17g fillings proportion is easier to fill and seal the dough. And, the skin is still not as thick. See picture below. 4. Greased the mould with some oil then dust it with some glutinous rice flour, before putting the dough into the mould. It is easier to remove the dough from the mould. Just dust a bit, please don’t coat it with flour. 5. Use medium-low heat to steam for 6-8 minutes (I steamed for 6 minutes as mine were mini Ang Ku Kueh). Steaming the Kueh on high heat for too long will cause the Kueh to expand which causes the prints from the mould to fade. Since the filling and 60% of the skins are cooked, there is no need to steam for too long. 6. To re-heat the Kueh that you kept in the fridge, boil the water in the steamer. When boiling, turn off heat before putting the Kuehs in the steamer and let it stand covered for 5 minutes. Last but not least, it takes a lot of practices to get the moulding and un-moulding right. At least for me, I only managed to get a few nicely moulded after my first batch of 8 – 10 that looks badly bruised. I didn’t have the Ang Ku Kueh moulds, thus I used my hard-case jelly/eggs moulds or you can use the moonlike moulds too. I tried using silicon moulds, it was difficult to get the print and shapes out nicely. So, I used back the hard case moulds. Just take great care when knocking it out as I have accidentally “smashed” a few when I knocked them out. You can keep the Ang Ku Kueh in the fridge for 2 days after cooking. It is still soft and chewy. But, I do not recommend keeping them longer than that as there is coconut milk in the ingredients. Have fun! By the way, i didn’t add any colouring so my kueh isn’t red in colour. My apologies that my Ang Ku Kueh is not ‘Ang’ (red in Teochew) in colour. Technically, mine shouldn’t be called Ang Ku Kueh as it is neither red nor in the tortoise form. Maybe, I can rename it to Orange Cutie Kueh 🙂 But, for convenience and easier recognition, I just called it by its common name. You can try using beetroot juice but I think it will turn pink rather than red. 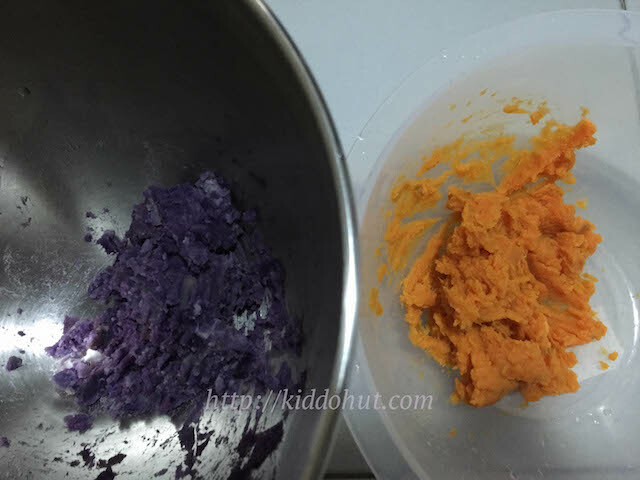 Use purple sweet potato (my first batch), it becomes purple kueh! p/s I think I will get some Ang Ku Kueh moulds for my next round of making. With the handle, it should be easier to knock the kueh out. 1. 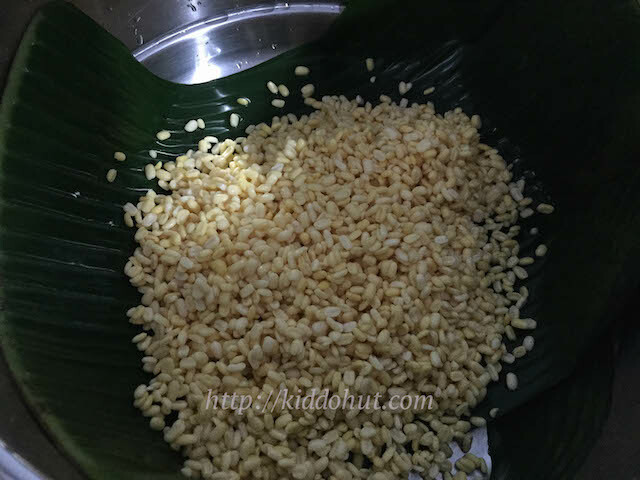 Soak the split mung bean for at least 2 hours. Discard the water and steam for 30 minutes. You may place the soaked beans onto a banana leaf and steam. 3. Add coconut oil (exclude this in this step if using food processor or blender), sweetener / sugar and salt into the mashed beans and mix well. Stir quickly to let the remaining heat melt the sweetener and salt. Set aside. 1. Steam the sweet potato for 15 – 20 minutes. I laid the sweet potato on a banana leaf and steam. After steaming, mash it using food processor or back of fork. 2. Add glutinous rice flour to the mashed sweet potato and knead. Add coconut / cooking oil, continue to knead. Add coconut milk by spoon and knead until you achieve a firm and manageable dough. If it is too wet, add a bit of glutinous rice flour. You may not use all the coconut milk or may use more, depends on the moisture level of the sweet potato. Dough should not stick to your hands. 1. Divide the dough equally into small portions approximately +/- 23g per piece for a 40g mould capacity. 2. Roll each portion slightly then make a little dent to the centre of each portion of dough, be careful not to push too deep and thin the wrap too much. 3. Place the fillings onto the centre of the dent. Then, wrap the filling and seal the opening. Try to fill the wraps with fillings without gap. It takes some practices to ensure the fillings do not overflowed. 4. Roll the ball slightly to ensure the ball is smooth. If there is crack, just put some oil and dust a bit of glutinous rice flour to smooth the crack. 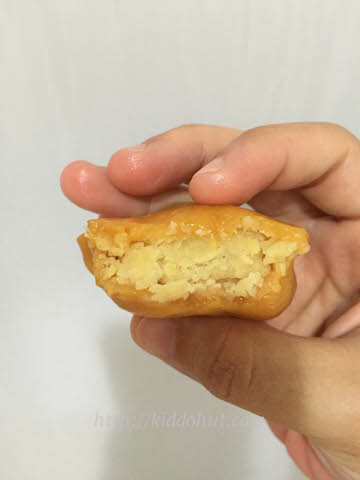 You can put some oil and dust a bit of glutinous rice flour on your palm and fingers to prevent the dough from sticking. 5. Greased the mould and sprinkle some glutinous rice flour onto the mould before putting the ball into it and mould. Knock the dough out of the mould. 6. Greased the banana leaf and put the dough on it. 7. Brush some oil on the top of the Ang Ku Kueh. 8. Steam over medium-low heat for 6-8 minutes. 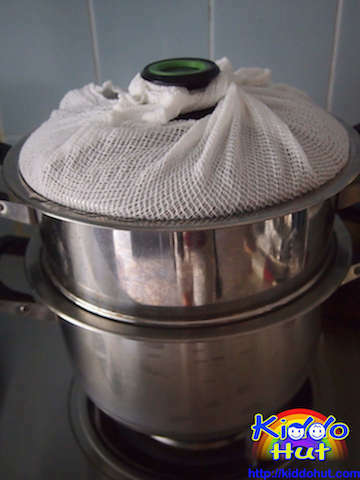 Cover the steamer cover with a cloth to prevent water vapour from dripping onto the kueh. To re-heat, steam it over hot water (off heat once water boils) for 5 minutes. Serve.